Resting in Quebec City at Place Royale, site of Samuel de Champlain’s first permanent settlement in New France. The older my children get, the more discerning they become about holiday activities. My teenagers Ryan and Emma are not big on cycling, history or museums. And like most people they don’t like rain much either. So there we were with our bikes in the rain, standing outside The Museum of Civilization in old Quebec City. “Well at least it’s dry in the museum,” I reasoned. “Can’t we just find somewhere to eat?” asked Ryan. It wasn’t the first time Quebec had witnessed a clash of wills – what military historians might call an impasse. After a three-month siege in 1759, it took General Wolfe and the British about 15 minutes to beat Montcalm and the French in the Battle of the Plains of Abraham. Keep your head up riding through crowds of shoppers in the narrow, cobblestoned lanes of Quartier Petit Champlain. Once a fur-trading portside village, it’s now full of boutiques, bistros and frescoes. It took the Judds about the same time to finish arguing, lock their bikes and enter the museum. Then something remarkable happened. “Game Story, the exhibition you play,” read the sign in the lobby. Yes, besides first-rate exhibitions about Quebec history and a showcase of Paris between 1889 and 1914, The Museum of Civilization was hosting a video game exhibition, featuring 450 artifacts and 88 video games to play. Everything from World of Warcraft to Pong was available. We were still in the museum long after the rain had stopped and the sun had returned. It was just the first of several surprising events during our two-night stay in Quebec City. That night we cycled our bikes to the Port of Quebec Agora, an amphitheatre hosting Cirque du Soleil’s Les Chemin Invisibles. Quebec City might just be the only place where Cirque du Soleil is free! Had they been charging, our floor tickets would have cost a fortune because most of the show unfolded just a few yards from where we stood. The Harbour of Lost Souls is the fifth chapter of Les Chemin Invisibles. The employees of an old customs officer decide to put on a show for his birthday in the hopes of helping him to find purpose in his life. The show is spectacular in its conception with performers suspended from cranes just a few feet above the audience and on moving stages that spring up in the crowd. Just across from the National Assembly is the Fountaine de Tourny, built for the city’s 400th birthday. It’s a popular spot for wedding photos and knackered cyclists. Cirque du Soleil is a tough act to follow, but the Image Mill is timed to follow it and succeeds if only for its epic setting. A legacy of Quebec City’s 400th birthday in 2008, the Image Mill is a sound and image show projected onto massive grain silos in Quebec’s harbour. We joined the hordes lining the harbour to watch this summer’s show, a tribute to Scottish-born, Canadian filmmaker, Norman McLaren. A pioneer in synchronizing animation with music, McLaren, who died in 1987, would surely have approved of his work being presented on the biggest ‘big screen’ ever conceived. Back at the Hotel Royal William in Quebec City’s trendy New St. Roch neighbourhood, we locked up our bikes and I ventured out for a nightcap on Boulevard Charest Est. The Mo Resto Bar had one more surprise in store for me; beer pumps at the table! The beer is metered of course (it’s not heaven) at 35 cents an ounce. But for my wife, I might still be there pouring modest amounts of Belle Gueule Blonde or Red ale. Thanks to the success of Day 1, we sold the kids on a guided bike tour the following day. 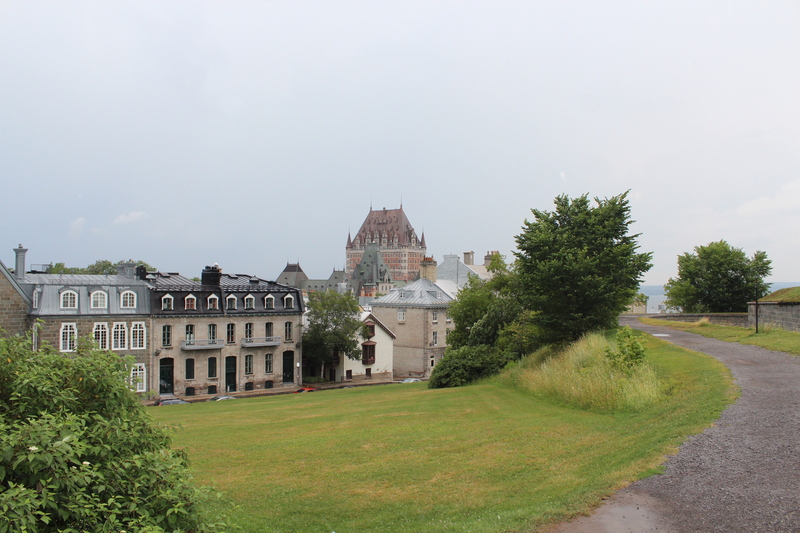 At first glance, Quebec City doesn’t appear built for bicycles. Narrow lanes, cobblestones and hills usually look good in postcards, not from a saddle. But first impressions can be deceiving. A few bumps and the occasional grind are a small price to pay for a two-wheeled tour of North America’s only walled city and UNESCO World Heritage site. For visitors with more time, there are several hundred kilometres of bike trails to ride beyond the fortress walls. Our guide, Marc Lupien of Cyclo Services, has been riding the same Nishiki road bike for 35 years (“I changed the brake cable once or twice – and the seat!”) and has seen the growth of bike culture here. 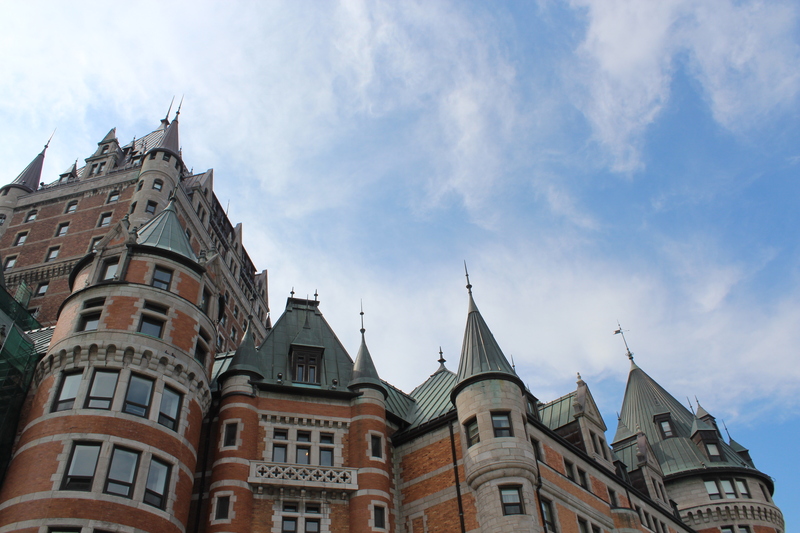 Chateau Frontenac, the most photographed hotel in the world and surely the inspiration for Hogwarts. While bike lanes line the edge of the St. Lawrence River and part of the escarpment above, cycling through Vieux Quebec itself takes some improvisation. In summer the streets are busy with pedestrians preoccupied with their centuries-old surroundings. Fortunately, it’s legal to ride the sidewalk and we were soon slaloming on either side of the kerb. Just across from the National Assembly we stopped at the Fountaine de Tourny, built for the city’s 400th birthday and a popular spot for wedding photos. It was hard not to notice the monolithic Hilton and Delta hotels, whose desperately unimaginative architecture is in dramatic contrast to most buildings in Vieux Quebec. We lingered in Place Royale, site of Samuel de Champlain’s first permanent settlement in New France. Grey stones mark the footings of where Champlain’s home once stood, right outside Notre Dame des Victories, the oldest stone church in North America, dating back to 1687. There are similar grey stone markers all over Old Quebec, said Marc, signalling other historic sites that would be impossible to excavate now. Near the Citadelle atop Cap Diamant, adjoining the Plains of Abraham. We rode the waterfront and part of the old port of Quebec before an adventurous ride through crowds of shoppers in the narrow, cobblestoned lanes of Quartier Petit Champlain. Once a fur-trading portside village, it’s now full of boutiques, bistros and frescoes. A funicular railway connects the area to Dufferin Terrace, a beautifully landscaped boardwalk with the best view of the St. Lawrence River. It seemed like a fitting place to stop for an ice cream and consider the view Champlain enjoyed in 1608. People had told me that Quebec would remind me of an old European city. 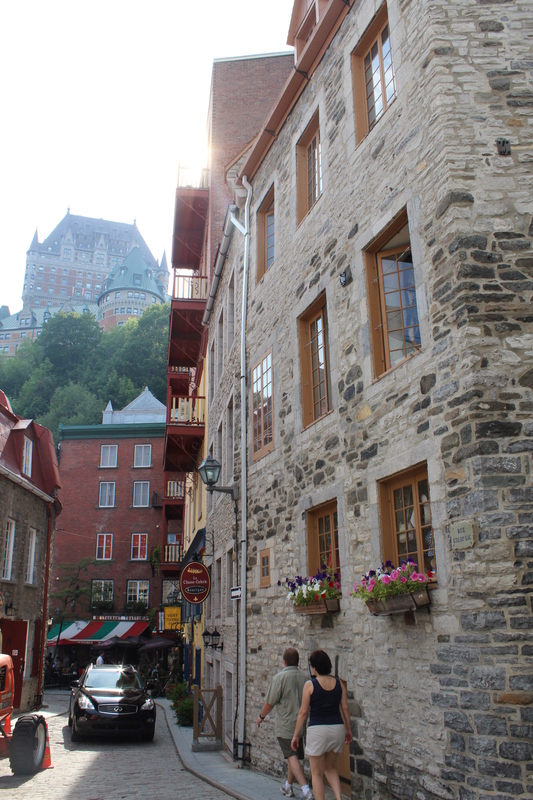 Aside from medieval Bruges in Belgium, I don’t know of another place as beautiful as Quebec City. Even Ryan and Emma liked it! 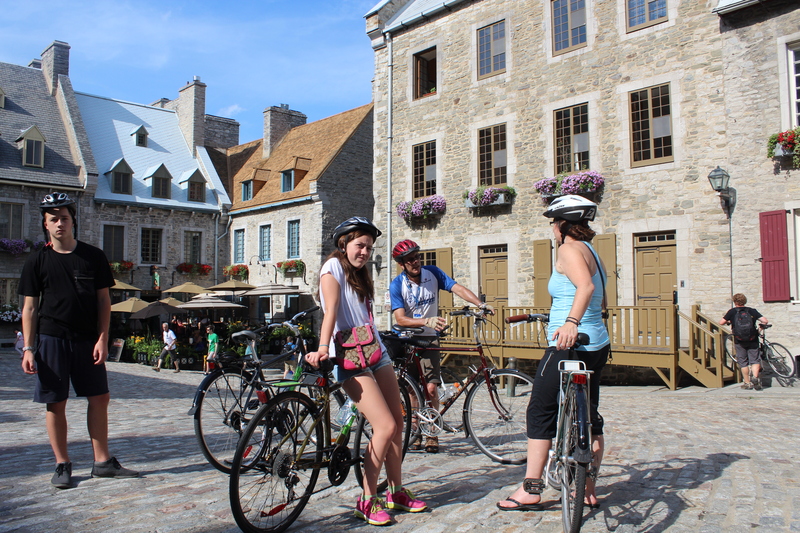 In the heart of old Quebec City since 1995, Cyclo Services offers bike rentals and a variety of guided bike tours. Visit http://www.cycloservices.net or call 1 877 692-4050. Free shows by Cirque du Soleil and the Image Mill are known collectively as Rendezvous sous les Etoiles and run Tuesday to Saturday, concluding with a Sunday performance Sept. 1. 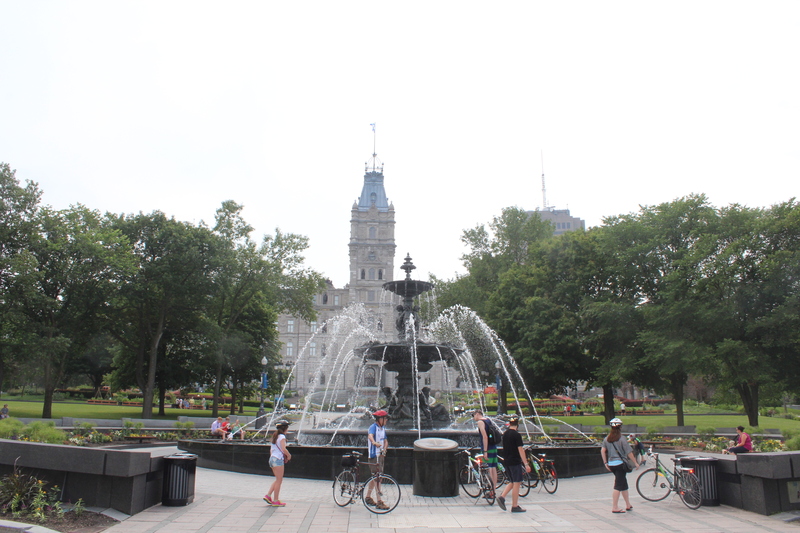 Yes, we did go cycling too around Quebec City. Glad your children took in the local historic sites by bike.